Apples, Apples, Apples! Nothing says Autumn better than apples–Red Delicious, Golden Delicious, Cortland, Cameo, Paula Red, Granny Smith, Gala, Ginger Gold, Macoun, McIntosh, Empire, Fuji, Jonamac, Jersey Mac–take your pick! Red, green, soft, firm or crisp, there is nothing like the sweet essence of fresh Autumn apples. Add a little sugar–maybe some flour and butter, too–and you have apple crisp, apple fritters, apple sauce, apple pie and apple donuts. Of course, don’t forget sweet or hard apple cider, apple wine, even apple vodka! Need we say more? Well, yes, actually…our local poets have plenty to say about apples, too! Digging through our archives, we found several haiku from our contributors. We thought we’d share a couple with you including this artfully written haiku by Sallie Bailey (Fayetteville NY) in 2010. If you’ve ever driven south on I-81 towards Lafayette and Beak and Skiff Apple Orchards, you’ve seen this remarkably beautiful scene! 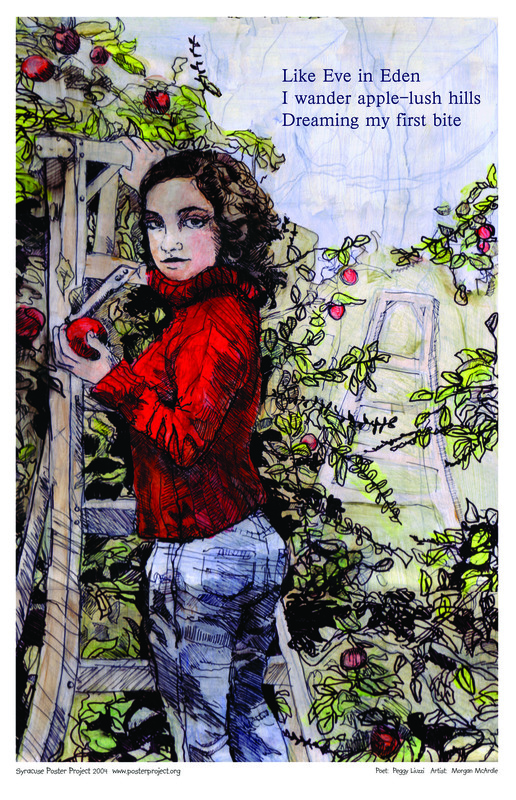 Kathleen Nyzio’s (Skaneateles NY) charming 2011 haiku deftly describes the sensory effects apples can have on us–even in our dreams and memories! Sweet apple orchards Cinnamon spice flooded dreams Wake me up, autumn! And since we’re speaking today of apples, we could not resist (no pun intended) revisiting this gorgeous 2004 Syracuse Poster Project haiku poster. The poet: frequent Syracuse Poster Project haiku contributor, Peggy Liuzzi. The artist, former Syracuse University Illustration student, Morgan McArdle, now a storyboard artist and illustrator living in Sherman Oaks, CA. Twilight’s harvest sky Frames apple boughs, pumpkins, drifts of leaves. We are home.